The overall goal for the New Hampshire Cover Crop Team’s activities is to encourage adoption through peer-to-peer interaction and support. We intend to recruit farms to partner with us for educational activities and on-farm demonstrations. While we are primarily looking to highlight farms that use innovative cover crop species or planting practices, we also want to include a variety of production systems, including both field crops and horticultural crops; both conventional and organic management systems. We propose organizing two statewide Cover Crop Forums, in fall of 2016 and 2017. These events will be day-long, indoor programs where participants will have the opportunity to learn from their peers. Between fall 2016 and fall 2018, we will hold eight smaller scale field meetings in various locations around the state. 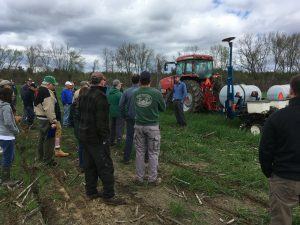 These sessions will be held at the cooperating farms listed above and will highlight specific practices and techniques pertaining to the use of cover crops. On three sites where field meetings will be held in 2017 we will establish small field-scale (1-2 acre) plots with side-by-side comparisons to highlight issues of concern to farmers in the state and to demonstrate practices already known to be successful but that have not yet been widely adopted. We will produce a total of six short (approximately 5-10 minutes long) videos that cover the same innovative planting and management practices highlighted at the field meetings. There has been a marked increase in the use of cover crops in recent years. Farmers with a wide variety of cropping systems, and at a range of scales, are increasingly using cover crops in ways that enable them to achieve soil conservation goals while maintaining or improving crop yields. According to the 2012 Census of Agriculture, 5025 acres were planted to cover crops; according to NH NRCS, farmers took advantage of aerial cover crop seeding programs to sow cover crops on some 3500 acres of cropland in 2015, more than triple the acreage of the previous year. However, this is still only a fraction of the more than 15,000 acres devoted to the production of field crops and vegetables statewide. There are still many opportunities for farmers to make better use of cover crops to reduce soil erosion and conserve nutrients. 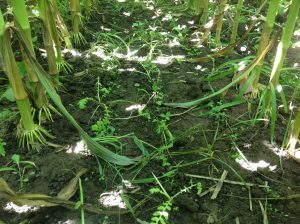 There can be significant hurdles to integrating cover crops into rotations. For example, some benefits of cover crops only become apparent after several seasons, when improved soil structure, reduced erosion, and conserved nutrients and organic matter results in better crop yields. Some producers perceive the cost of seed and labor for establishing cover crops to exceed the benefits, or that their use comes at the expense of crop yields. Even producers who are more motivated to experiment with and make greater use of cover crops face challenges. Farms select species from dozens of options and employ new or unfamiliar planting practices, and they may need equipment that isn’t easily available to them. Making the wrong choice with anything from selecting the wrong species to improperly terminating a stand may yield poor results and discourage further experimentation. We hope to continue the conversation that has begun about cover crops by highlighting examples where they have been used successfully. We will achieve this by providing opportunities for farmers to make direct observations in the field and to exchange dialogue with others who have found ways to make cover cropping work in this state. We held a meeting in June at Adrien Lavoie’s farm in Hollis focusing on his use of cover crops and no-till in vegetable production. There were 40 people attending, including eight people from NRCS and Extension. 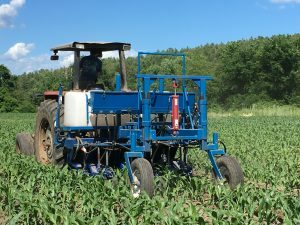 In November, we held a field meeting at Bohanan Farm, a dairy operation in Contoocook, to see results of plot demonstrating the use of a Penn State interseeder on field corn and to learn about the other ways the farm has been using cover crops. There were 26 participants, including six from NRCS and Conservation Districts. 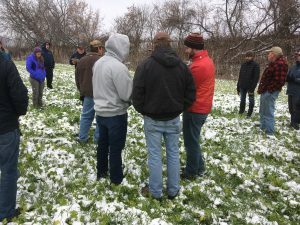 Participants saw the challenges involved with mid-season establishment of cover crops, and learned about methods for establishing them post-harvest. Our first Cover Crop Forum consisted of a tour of three dairy operations in Orford and N. Haverhill NH and Fairlee, VT that have experimented with cover crops, including use of a Penn State interseeder, living mulches, and a trial at the Grafton County Farm comparing mid-season and post-harvest establishment and different cover crop mixes. Following the tour, participants engaged in a facilitated discussion that touched on perceived benefits, establishment techniques, and species selection. The event was a collaboration between members of the team with the Grafton County Conservation District, UVM Extension, and NH-NRCS. There were 34 participants, including 5 from NRCS. We held meetings at Highway View Farm in Boscawen, Tullando Farm in Orford, and Moulton Farm in Meredith. The first two meetings focused on field corn production, with Highway View Farm owner and team member Adam Crete demonstrating his use of no-till ‘planting green’ into cover crops. In addition, we were able to demonstrate one of the corn planters outfitted with Dawn Biologic roller-crimpers purchased by NH-NRCS. The meeting at Tullando Farm in July demonstrated their experiments with using different species as ‘living mulches’ interseeded with corn, and also showcased the Dawn Biologic planters. The NRCS Soil Health Initiative had some money available in the state, and the NH Soil Health Working Group (NHSHWG) – representing NH-NRCS, state Conservation Districts, UNH Extension, and private industry – developed several cover crop seed mixes designed for different cropping systems and conditions across the state. The NH Cover Crops Team (which includes two members working with the Soil Health Group) helped to recruit farms to evaluate these mixes. To date there are some 21 farms participating. One of these, Moulton Farm in Meredith, served as the site for our third field meeting; attendees were able to observe how well the seed mix grew, and the differences in biomass with seeding date. 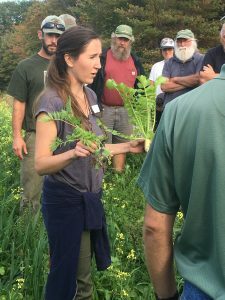 We held our second Cover Crop Forum on Nov 29 in Concord. The program was split between presentations from UNH faculty, NRCS, and area farmers in the morning, and a farmer-to-farmer discussion facilitated by Dr. Eric Sideman of Maine Organic Farmers and Gardeners Association (MOFGA) in the afternoon. There were a total of 31 participants, including 6 from NRCS. Morning presentations focused on integrating cover crops with vegetable rotations for organic operations, an update on the cover crop mixes developed by NHSHWG, and farmer adoption of cover cropping techniques. Discussion in the afternoon centered on topics identified by participants, including species selection, integrating with cash crops, and special pest management considerations. 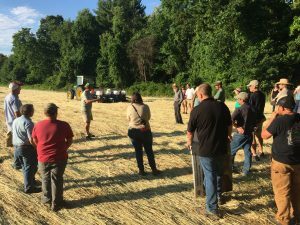 We held three field meetings at Heron Pond Farm in South Hampton in April, and at Longview Farm in Plymouth and McNamara Dairy in Plainfield in October. All three events showcased the producers’ cover cropping practices: integrating with crop planting and harvesting, species selection, and planting techniques. All three farms were also participants in the NHSHWG seed mix evaluation, so participants were able to observe how readily they established, how sensitive they were to planting date, and how well they overwintered. Initial observations indicate that the mixes developed by NHSHWG have established successfully. Much of fall in 2017 was characterized by milder-than-normal weather that allowed even late planted stands to provide effective ground cover; one field planted in the first week of October provided over 70% cover (as measured by the Canopeo app) by the first week of November. These trials provide evidence that multispecies cover crop mixes are feasible for both vegetable and field crop production systems. Despite an extended cold snap from late December 2017 until mid-January 2018, the stands seemed to have survived the winter, with even crimson clover – considered marginally winterhardy in NH – showing some regrowth in spring. Out of 27 farms that participated in the trial over the last two years, five have purchased these mixes to use on their own. In addition to the work outlined in the original proposal, the NH Cover Crop Team launched a new program in fall 2017 to recognize farms that were making effective use of cover crops and to encourage additional farms to follow suit. The We’ve Got it Covered! campaign provides signs that farms can display in their fields, highlighting their use of cover crops and increasing public awareness of their benefit to the environment. The effort was funded by donations from Johnny’s Selected Seeds and the NH Vegetable and Berry Growers’ Association, plus an AgEnhancement grant from Farm Credit East, enabling us to have 250 signs printed for distribution around the state. 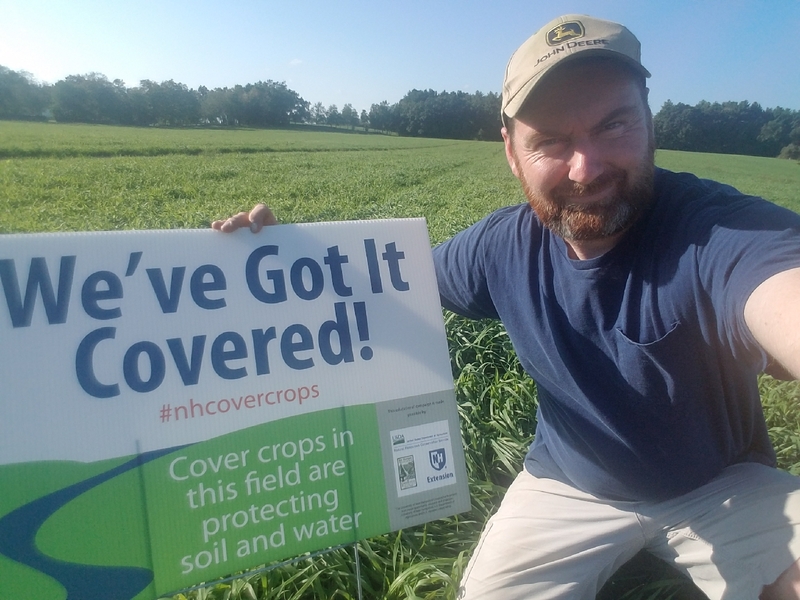 Any farm that planted cover crops was eligible to get a sign free of charge, and participating farms were encouraged to share photos on social media using the #nhcovercrops hashtag. The NH Cover Crop Team sent out a survey to people participating in their programs from 2016-2018. Four farms responded, two of them cropping more than 200 acres. 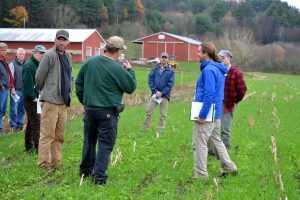 Respondents indicated that the workshops, farmer forums, and field meetings the team delivered increased their knowledge in the benefits of cover crops, planting techniques, and cover cropping practices and species mixes appropriate for use in NH. Ag service providers attending these programs indicated that they intend to share what they’ve learned with their clients.